How's it shakin? 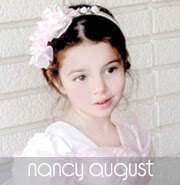 I wanted to do a short blog and ask my bridal bee buds your opinions on the princess syndrome. Halloween is approaching and many little girls are going to dressed from head to toe in their best princess outfits for the day. As a woman who thinks of myself as forward thinking, the idea of being a Disney princess seems archaic. They are beautiful and kind, but generally not the brightest nor strongest girls on the block. They get into predicaments and a man (nicely coiffed gorgeous prince or a hairy beast who turns into a beefy prince) saves the day. I worry about instilling an idea that confidence solely comes from outward beauty and snagging a handsome provider. I want to raise strong girls who can save themselves when a nasty ole witch locks them in a tower. If she meet a nice boy it's to compliment how awesome she already is, but not to make her more awesome. I find it a bit a bit odd and I wonder how you mommies and daddies feel about allowing your little ones to dress up in princess regalia. Do you allow it and like it or allow it and tolerate it or do you refuse to allow them to do it? I also wonder why it's so appealing? Don't get me wrong, when a little flower girl is dressed up in a princess outfit my heart melts a little. The outfit is generally a little ill fitting and the crown slighted off center, but outrageously sweet. When I get down to it I am the biggest supporter of allowing children to manifest their creativity in whatever form in may take. In the end it would be hypocritical to want to stifle a little girl's dream of wanting to be a princess. Please post your thoughts and comments. You can disagree, agree whatever you please, but please keep it clean. 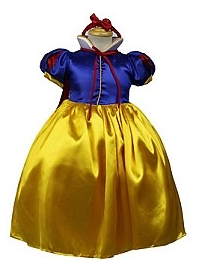 Snow White Princess Dress. I don't know what it is about snow whites outfit that I love. I never knew primary colors could be so whimsical and adorable. She is the Disney generations eve, eating the apple and paying for it. In the end she triumphs over that nasty Witch queen, now if she could just take a hammer to that mirror her life would be perfect. I also love this version of a princess dress because it is well constructed and made from nice strong material. It doesn't look cheap while still being affordable. Keep Our Flower Girls Warm!